Use of the OSU ScholarDollars system requires compliance with federal privacy laws (FERPA) , the Oregon Revised Statutes, and the Oregon Administrative Rules. These regulations protect the privacy of student educational records and regulate how student information is utilized. By logging into OSU ScholarDollars, you agree that you understand and will adhere to these standards, and that the data from student educational records will not be used for any unauthorized purpose. Starting November 1st, OSU students may use OSU ScholarDollars to submit an application for the nearly $50 million in campus-based scholarship funding available for the 2019-2020 academic year. By submitting one application, you will be considered for over 1,600 OSU scholarship opportunities! Newly-admitted and continuing OSU students are eligible to apply for scholarships through OSU ScholarDollars. Students must have been admitted to OSU and have an active ONID account to be able to log into the system and submit an application. Submit your OSU ScholarDollars application between November 1, 2018 and February 1, 2019 to maximize the number of scholarships for which you will be considered. Most OSU scholarships have a deadline on or after February 15, 2019, but specific deadlines may vary. 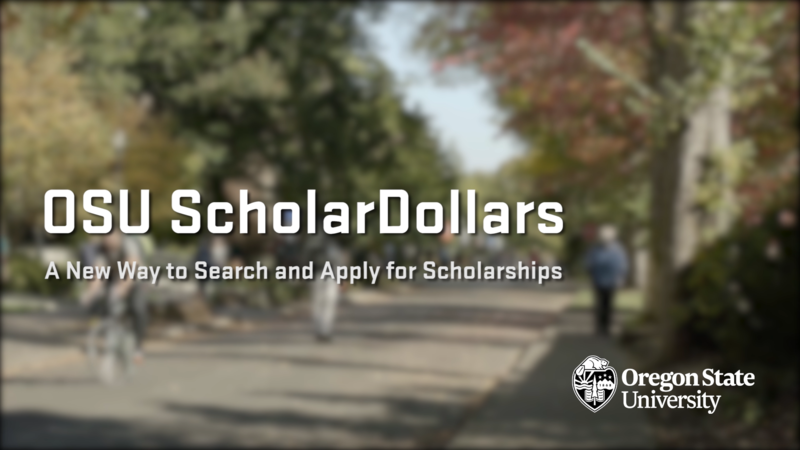 Merit-based, need-based, and activity-based OSU scholarships are available, and OSU ScholarDollars also offers a searchable database of external scholarships. OSU ScholarDollars is NOW AVAILABLE! Contact the OSU Scholarship Office to Request a User Account!